I am 95% done with the baby quilt I made for my friend. I still have to sew up a spot or two and do the quilting, but other than that, Finito!!! My first quilt, and the first thing I've sewn in years. Now that I've brushed up, I can work on the duvet cover for my bedroom. 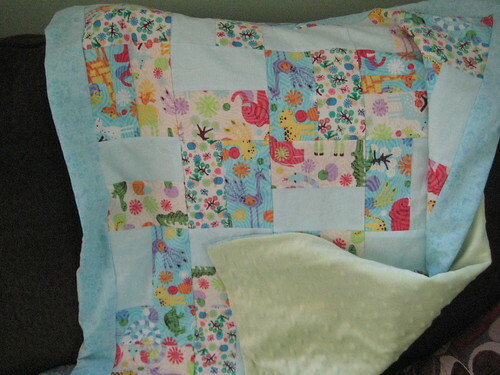 I used a pattern from "Quick Colorful Quilts for Babies and Toddlers" by Rosemary Wilkinson. It was a very basic book, although I had to do quite a bit of math in order to cut out the rectangles. But I think it turned out well. All of the seams and joints between rectangles lined up and everything. That is a beautiful quilt!! I love it! This is beautiful! I love the fabric!